Banned Books Week is the national book community’s annual celebration of the freedom to read. Hundreds of libraries and bookstores around the country draw attention to the problem of censorship by mounting displays of challenged books and hosting a variety of events. 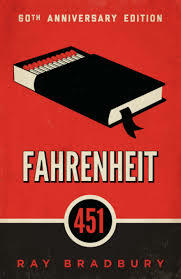 The 2013 celebration of Banned Books Week will be held from September 22-28. In honor of this annual celebration of the freedom to read, The Booklover is giving away the 60th Anniversary Edition of Farenheit 451 by Ray Bradbury. To enter subscribe to this blog, then leave a comment below telling us about your favorite banned book. (If you already subscribe to this blog, mention that when you leave your comment.) The winner will be randomly selected on September 28, 2013 — the final day of Banned Books Week 2013. We’ll announce the winner the week following Banned Books Week. Good luck and don’t forget to celebrate with a banned book!